"Created by Tara Fadenrecht, the installation Divulgence references both positive and negative attributes of security. In addition to video and sound components, three unique tubes, constructed of hand-woven polypropylene and steel strapping, grow into the Pop-Up Art Loop space. Although the tubes carry similar features, each takes its own path and ultimately comes to its individual ending. Divulgence presents the viewer with reflections of three separate states of awareness regarding believed security--denial, angst and healing. 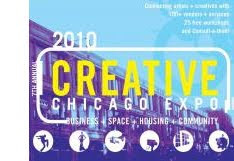 This exhibition is part of the Chicago Loop Alliance Pop-Up Art Loop initiative. www.popupartloop.com"
The Creative Chicago Expo is a free, daylong event that takes place throughout the Chicago Cultural Center. It has three main components: Vendors, Workshops and Consultants. Vendors are grouped by discipline or service in GAR Hall, GAR Rotunda, the Randolph Street Cafe, and under the dome in Preston Bradley Hall. Workshops and Consult-a-thon are held in meeting rooms and the wings of Preston Bradley Hall. Interiors is a new show opening at Ann Ponce Studio located at 1819 West Wilson Avenue which includes work from five RAW artists. 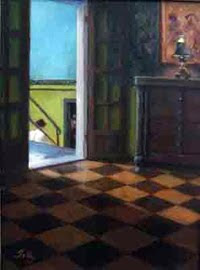 Artists explore the interior through their art forms. For more information contact Ann at www.annponce.com. 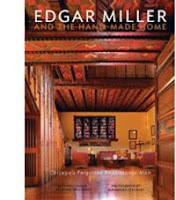 Richard Cahan and Michael Williams, co-authors, will present a lecture on their recently published book,Edgar Miller and the Handmade Home: Chicago's Forgotten Renaissance Man. The book reveals Miller's accomplishments and his mastery of some two dozen crafts including painting, metal smith, stained glass, carpentry, and just so much more. The photographs are gorgeous, as they need to be in order to do justice to the color, variety and texture of Miller's work in every medium. Everyone will be astonished by the warmth and variety of Miller's creations. This is a great opportunity for anyone that is interested in architecture, art, Chicago, and anyone who cares about true craftsmanship. The book has been garnering media and impressive reviews on NPR, WTTW, and is available for sale at amazon.com. 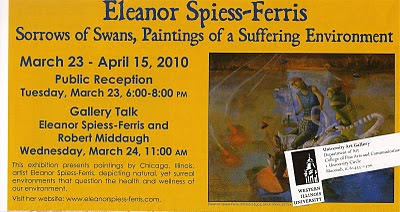 The lecture will be held April 14 at the historic Billboard Factory located at 4025 North Ravenswood (very easy to locate! ), which is an amazing space itself. Hayes Properties has renovated the previous factory to a three-storied venue, which is available for private functions and suitable for grand scale events and intimate gatherings with panoramic views of the Ravenswood Corridor and beyond. Paintings by Winifred Godfrey depicting the distinctive textiles of the Mayan people of the Guatemalan Highlands will be on display at the Renaissance Court Gallery in the Chicago Cultural Center at 78 E. Washington St., Chicago, Ill., from March 26 through May 2, 2010. There will be an opening reception on Friday, March 26 from 5:00 – 7:30 p.m. Included will be a sale of Mayan handicrafts. The following Wednesday, March 31 the artist will give a slide presentation on Guatemala at 2:00 p.m. Renaissance Court Gallery is managed by the Chicago Department of Family and Support Services, Senior Services – Area Agency on Aging, enter at 77 E. Randolph St.